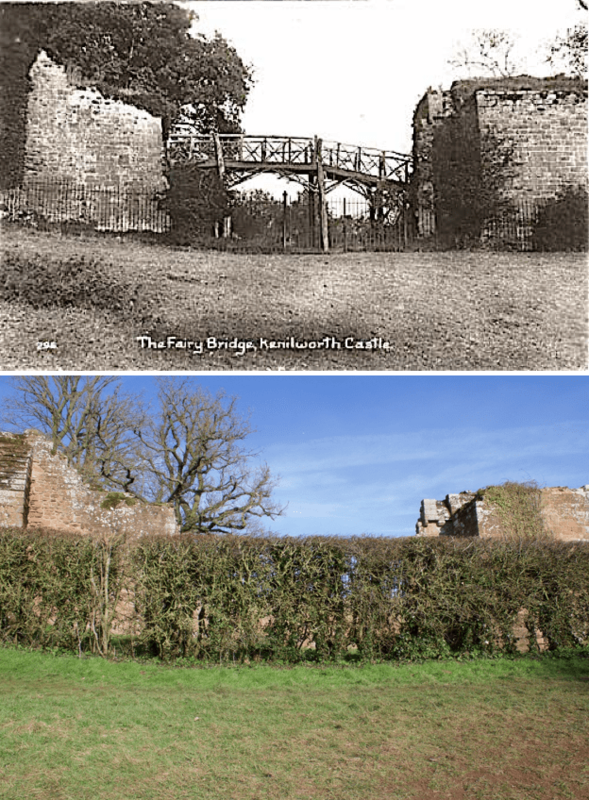 This Then & Now comparison shows what is variously referred to on old postcards as either the ‘rustic bridge’ or ‘fairy bridge’, which once connected Mortimer’s Tower to the outer bailey. This allowed visitors inside the castle to cross outwards to visit Mortimer’s Tower at a time when it was otherwise inaccessible from either inside the castle or from the direction of the tiltyard. The O/S map from 1892 to 1914 shows a dotted path for visitor access to the castle running along the modern lower section of the tiltyard, and then taking a sharp right turn on a path underneath the fairy bridge (marked ‘F.B.’ and shown in yellow below) into the castle compound. The reason that Mortimer’s Tower was severed from the rest of the curtain wall in this way is conventionally accepted to be that a farm track had been driven through here at some point when the Castle was operated as a farm by the Earls Clarendon, to provide access from the castle to meadow land in the direction of echo meadow. This is currently considered to be a more likely explanation than the alternative theory that this gap was an original drawbridge type of feature, due to the lack of any evidence of a tower into which such a drawbridge could be pulled up. What we see today is of course the latest of a number of phases of building in the castle, so it is possible one of the famous double ditched defences did once protect the inner bailey of the castle here in earlier times. The Fairy Bridge can clearly be seen on this 1947 image from Britain From Above but it had gone by this 1953 image. The 1953 image shows that, while the bridge had been removed, the gap it spanned had not yet been filled in, which was undertaken later as part of the layer mid-sixties work to re-establish the tilt yard route into the castle. The modern infill to this ditch makes it impossible to examine the stonework either side of the ditch to determine whether it was part of the original castle defences or part of a farm track driven through by Earl Clarendon.